CAPTIVE airplanes with clipped wings would hurtle across country at more than six miles a minute, in a “flying-railway” system proposed by a European engineer. 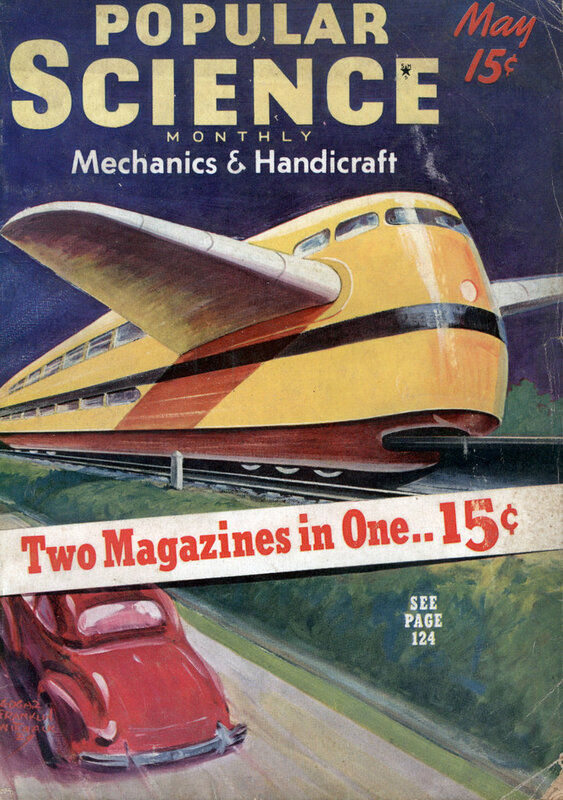 His scheme calls for a giant new type of streamline passenger car, having stubby wing surfaces and a body like the fuselage of an airplane. At low speeds, as in starting and stopping, the vehicle rolls along standard rails on flanged wheels at front and rear. Under full throttle, however, the whole front of the car rises from the track and, lifted by the wings, rides on air, so reducing friction that speeds up to 400 miles an hour may be attained. Retaining channels and rollers prevent the forward or “flying” end of the car from zooming dangerously high. Meanwhile the rear wheels, remaining in contact with the rails, continue to supply propulsive force from the vehicle’s Diesel power plant. 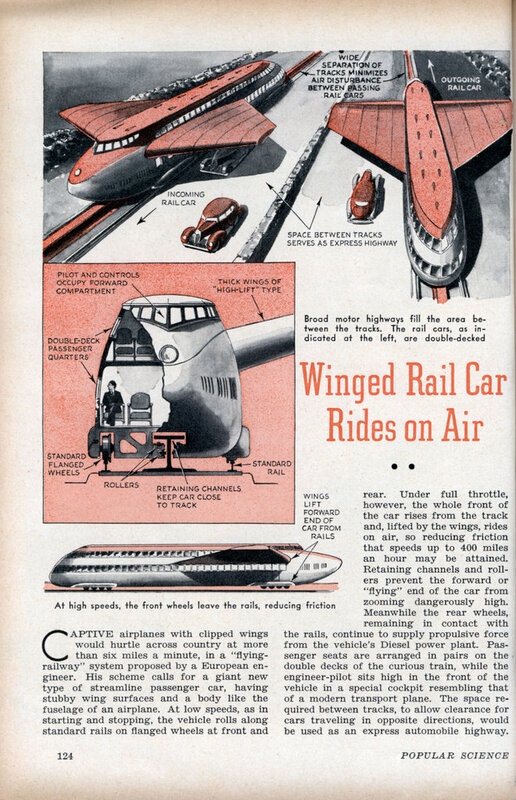 Passenger seats are arranged in pairs on the double decks of the curious train, while the engineer-pilot sits high in the front of the vehicle in a special cockpit resembling that of a modern transport plane. The space required between tracks, to allow clearance for cars traveling in opposite directions, would be used as an express automobile highway. If you create less friction on the rails don’t you also experience a loss of drive power? Unless it was flexible in the middle the rear wheels would not be sharing equally in the drive. Wings large enough to have any significant effect on something as a self-powered train would probably be much bigger than the ones shown. Judging from the size of the seated passenger the wings are only about 10-12 feet off the ground. This would require a HUGE right-of-way with no telegraph or power poles. It looks like its at least the width of a 12 lane freeway. See also the “Capsian Sea Monster”. I’m laughing at your obvious observation that I missed. One thing more than any other will kill this idea – induced drag. This is drag caused by the creation of lift, and would considerably increase the amount of energy required to move it (weight from the duplication of undercarriage and the wing notwithstanding). Even with all of the space in the designers plans there would be a fairly uncomfortable shock every time two of these passed in opposite directions from each other, from their wing tip vortices (assuming they didn’t blow cars off the road before they ever got that far). Finally attempting to stop this (with steel wheels on steel rails) at anywhere near the projected speeds seems somewhat problematic. Airliners need 6000+ foot runways for a reason – and they have more to work with when it comes to slowing down. It seems to impose the worst of both trains (rigid infrastructure) and airplanes (energy losses due to the generation of lift) without really gaining anything from it. As you can see, in the Japanese design, any worries about wing-tip vortices are dealt with. The 20’s & 30’s were times when anything you can think of can be possible. Kind of cool.